Great Song title by the late Roy Orbison and unless you’ve experienced the disappointment of entering a Chess Congress and not reaching expectations,…then there is no lonelier place to be than somewhere way down the board Order with a game to go. Literally with nothing to play for….. your heart, mind & body are screaming within……………Time to go HOME…..and you’re drawn against the one person who plays every move as though their very life depends on it……………nothing lonelier than that………..believe me!! Sean, Robbie and Padraig did not wait following early morning reverses. which left 5 hardy club souls battling the afternoon session. The Major section saw Gabor Bolkeny finish ahead of his team-mates with 3.5/6. Sean and Danny Dwyer scored 3/6 with Marius Antohi finishing strongly to record 2.5/6. Robbie also scored 2.5/6 in the James Mason. The Challengers saw our O’Hanlon Captain Mark Cummins score 4/6 and a joint share of 11th-21st place. A fine recovery from an awful Saturday and it would be even nicer if he could win in the league….hint hint!! 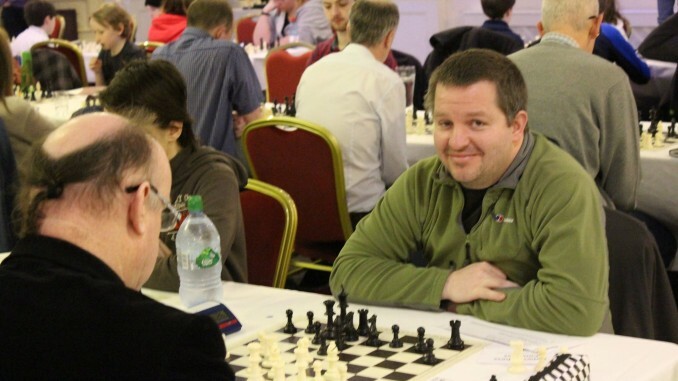 Mikhail Diaconu scored 3/6 in his first Irish tournament with Padraig ending his involvement with 2/6. Well done to all who competed,,,safe journey home lads.